The Bavarian People's Party (German: Bayerische Volkspartei; BVP) was the Bavarian branch of the Centre Party, a lay Roman Catholic party, which broke off from the rest of the party in 1918 to pursue a more conservative, more Bavarian particularist course. The party displayed monarchist leanings (because many Bavarians had never accepted the overthrow of the House of Wittelsbach in 1918) and there was a period of near separatism in the early 1920s, culminating in Gustav von Kahr's unwillingness to abide by rulings from Berlin during the autumn crisis of 1923. This only came to an end with the shock of Adolf Hitler's Beer Hall Putsch. Following the establishment of a more stable situation throughout Germany, the party came around to a more moderate line under the leadership of Ministerpräsident Heinrich Held and party president Fritz Schäffer. During the Weimar Republic, the BVP was consistently the most voted party in Bavaria and the party with the most seats in the Landtag of Bavaria. 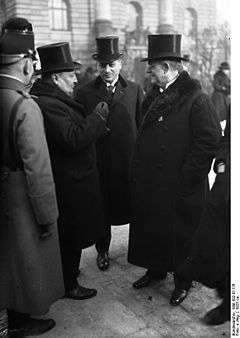 In the second round of the German presidential election, 1925 the main contenders were Paul von Hindenburg and Wilhelm Marx. If either the BVP or the Communist Party (KPD), who put up Ernst Thalmann in the second round, had supported Marx, he would have become President instead of the elderly von Hindenburg (who died in 1934, and was succeeded by Hitler). The party may be seen as a precursor to the Christian Social Union in Bavaria but alongside the CSU, the Bavaria Party (Bayernpartei) - which has members elected to city councils in some Bavarian regions - and the Bavarian Centre Party (bayerische Zentrumspartei) were also refounded after World War II and are explicitly claiming the historical heritage of the BVP. ↑ Stibbe, Matthew (2010). Germany, 1914-1933: Politics, Society and Culture. Pearson Education. p. 79. ↑ Stibbe, Matthew (2010). Germany, 1914-1933: Politics, Society and Culture. Pearson Education. p. 59. ↑ Richard J. Evans (2003). The Coming of the Third Reich. Allen Lane, London. p. 82. ISBN 0-7139-9648-X.